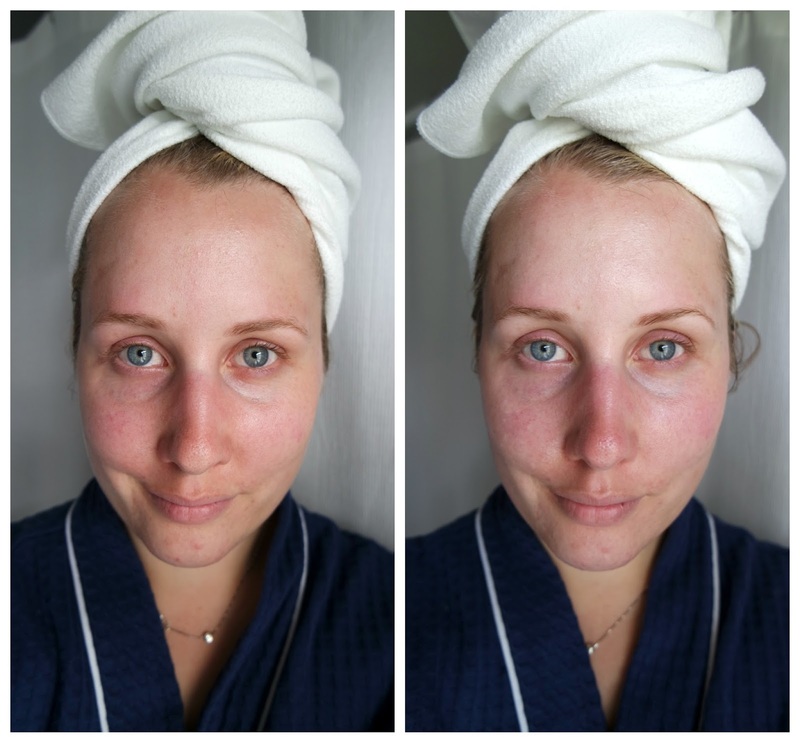 I have gotten two facials in my life, and both times, my skin felt amazing afterwards. Unfortunately, I can't really afford to get a facial too regularly, so I try to make up my own routines at home. My own mini facial routine is typically Glam Glow's mud mask, followed by a sheet mask, and then possibly a sleep-in mask as well (I currently am using Origin's, and really enjoy it!). 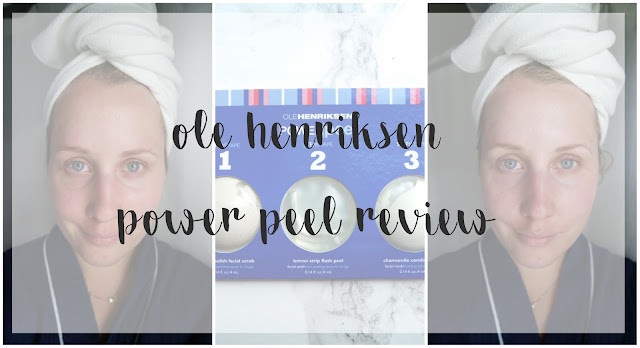 Recently, I ran across Ole Henriksen's Power Peel while perusing Sephora's skincare section, as one does. The reviews were amazing - brighter skin, smaller pores, more evenly toned - the list went on and on. I really liked the idea of the "facial at home" aspect, so I ordered a two pack to try out. It's basically three masks, laid out for you to follow in order. The first is an almond scrub, the second is a lemon peel, and the third is a calming chamomile mask. When I was younger, I lived for St. Ive's apricot scrub. I must have gone through at least a dozen of those tubes of super gritty mask. The almond polish scrub in the Power Peel back is basically the grown up version of the almond scrub - the smell is so similar, and it honestly does feel pretty close to the apricot scrub as well. 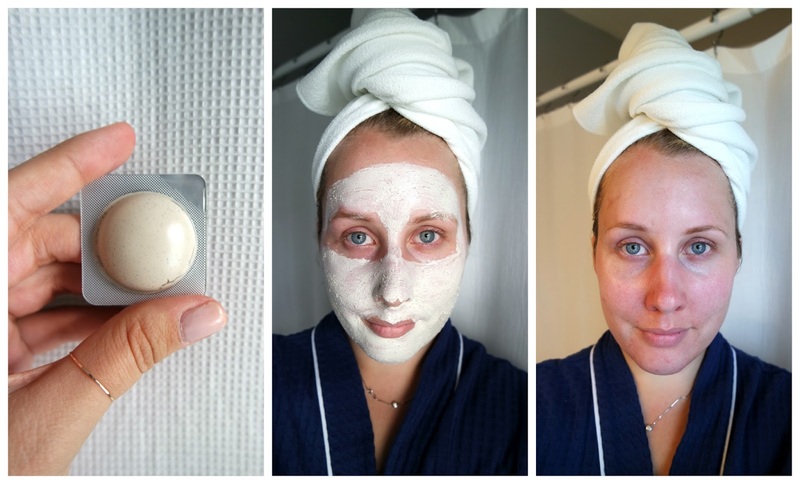 The way you use it is like you would any other scrub - put on face, move it around - and then you use one of the "complexion sponges" (which are really just normal sponges) to remove it. Afterwards, my face honestly felt pretty clean and smooth. I definitely enjoyed this step of the process! A 20% AHA Complex exfoliates in 3 ways to resurface by supporting natural cell renewal: lactic acid is a natural, gentle exfoliant that doubles as a humectant; glycolic acid penetrates skin deeper to support natural cell turnover for softer, smoother skin; and a fruit acid complex is a concentrated blend of five botanical extracts containing naturally occurring AHA’s that work to exfoliate by weakening bonds of dead skin cells so they can be shed from skin’s surface. While it may very well do that, it really does sting a lot when it's on your face (as one would expect when putting "acid" on your face, especially after using a scrub right beforehand). The way you use this is by spreading it on your dried face (I use the brush from my Glam Glow set), and then wait two minutes. You guys, my face was basically on fire. I was fanning myself, I felt so hot...it just all around wasn't an enjoyable part about this process. It stings, for sure, but I kept telling myself that this is just a part of the process. 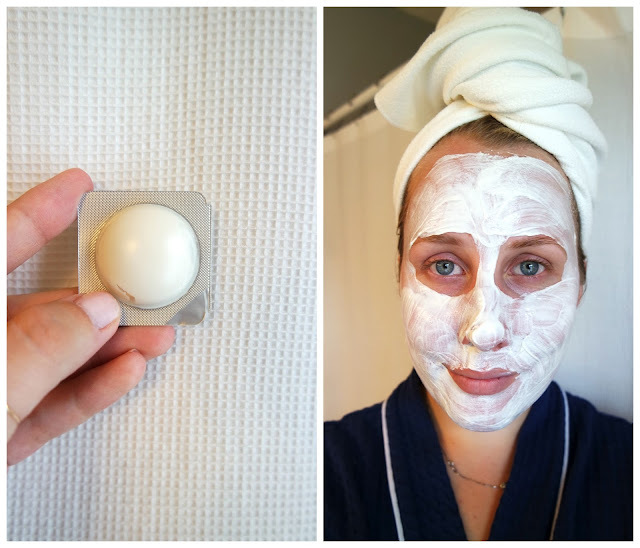 The last step is applying the calming chamomile mask without removing the lemon peel mask. This definitely helps with stinging sensation from the lemon peel - by the end of the 15 minutes, the stinging was completely gone. Then I washed it off using that complexion sponge again. I didn't really think I had sensitive skin until I used this product, but I really reacted to the process of using the Power Peel set. My skin was red and blotchy afterwards, something that isn't as apparent in the picture on the right as it was in real life. 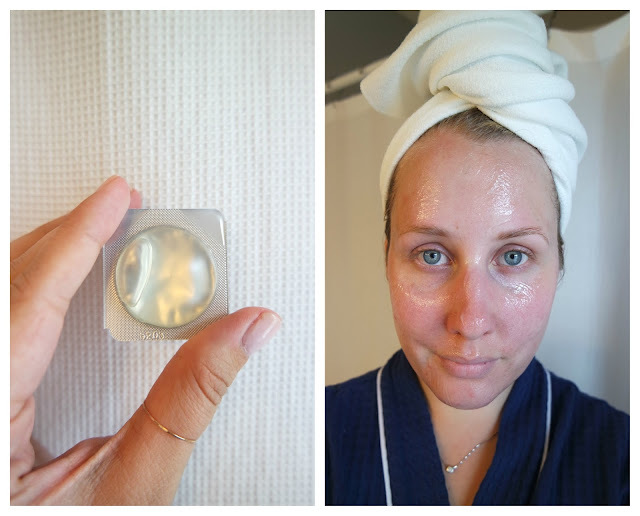 I used the peel on Saturday morning, and didn't have plans until that night, so I put on a face oil and heavy moisturizer to help calm down my skin, which it did, but for me, I didn't have immediate glowing smooth skin like I have with previous mask combinations. Now three days later, I personally don't think it made much of a difference in my skin. In fact, my chin is breaking out and my skin is drier than it was before. Is it worth $10 a pop to have red blotchy skin and not much of a change? For me, not so much. It seems to be a real powerhouse for others though, so take my review with a grain of salt, as everybody's skin reacts to products differently. The other thing I don't love about the system is that you have to use the full amount of each packet. I try to make my expensive skincare products last as long as possible, so I personally didn't love having to use more product that I thought was necessary (which is a similar sentiment among previous reviews I read). If I could buy that almond scrub by itself, I totally would. From what I can tell, they used to sell this as individual jars, which I would greatly prefer to these individual packets. One argument made for the individual packets is that they are great for travel, which is probably true for someone who reacts better to the mask than I did, but I don't think I'd take this with me on a vacation just because of how splotchy and irritated my skin was. p.s that towel on top of my head is a microfiber hair towel from Aquis. I've been using it for several weeks in an attempt to reduce the frizziness that normal towels cause, and so far I'm very pleased! Plus it's so nice to use a lightweight towel that can be easily tucked up rather than have a giant towel on my head, especially with the current heatwave (we don't have AC in our house except a window unit in our bedroom, so I'm sweaty the second I get out of the shower). It dries my hair quicker than a normal towel does, which help cuts down on both the air drying (that causes frizzing) and heat drying (that damages your hair). Just thought I'd mention it in case anyone isn't currently happy with their hair drying situation!